The brook, Megalopotamos, enters a desertlike canyon with reddish rock walls. The last kilometre of the gorge resembles a palm tree oasis. This single-arched bridge from 1850 may no longer serve its purpose today, but is still accessible on foot. It bridges the Megalopotamos (Eng. 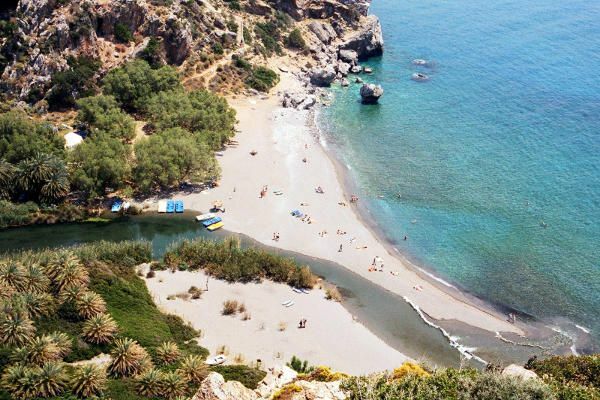 : large brook), which later flows across Preveli beach and into the Libyan Sea. 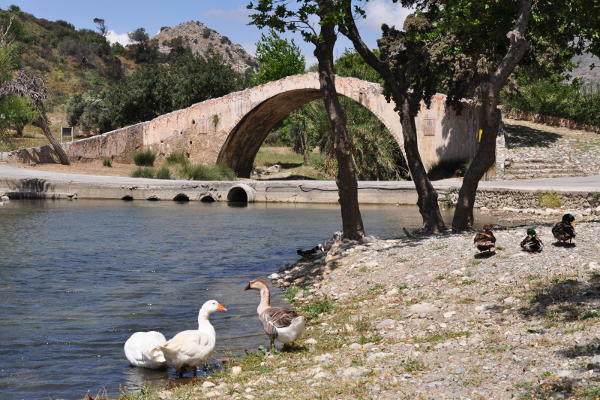 There is a wonderful summer taverna right by the bridge, where ducks and geese provide entertainment. These impressive monastic ruins lie below street-level in the Oleander Valley, which Megalopotamos flows through all year round. 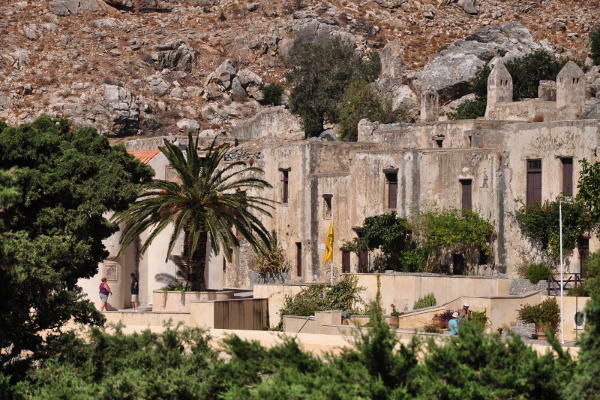 The monastery was founded in the 17th century, but has been uninhabited since it was destroyed by the Ottomans in the middle of the 19th century. It is fenced off because of the risk of collapse, but you can go inside when the gate is open. Otherwise, you can take beautiful photos of the monastery from the street, if you are at least 1.75 m tall - tall enough to hold the camera over the fence. There is no road to Preveli Beach and the palm-lined canyon. 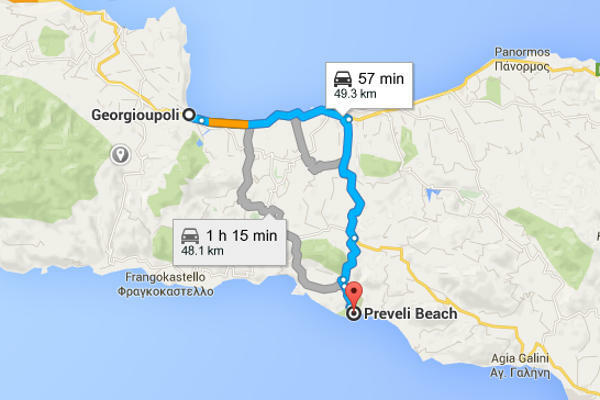 You either arrive by boat in the morning from Plakias and Agia Galini, or you hike down for about 20-30 minutes from the large car park. 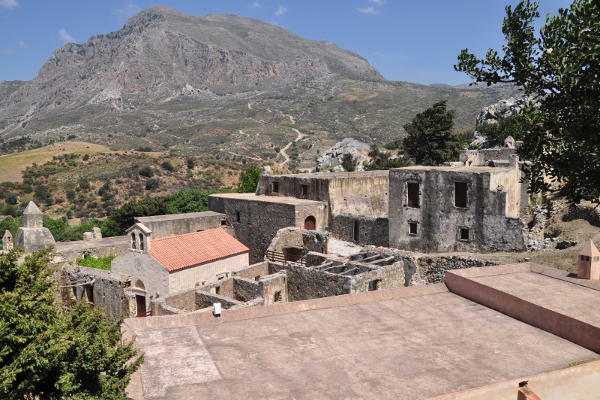 You can reach the car park via a dead-end street leading off the road to Piso Preveli Monastery. Just behind the Ottoman bridge next to Kato Preveli Monastery, the Megalopotamos enters a desertlike canyon with reddish rock walls. The last kilometre of the gorge resembles a palm tree oasis. Then the river broadens and winds across a coarse, sandy beach, losing itself in the Libyan Sea. Sun worshippers can lie between the warm salt water and cold sweet water on this beach, which offers no shade. Beaten tracks lead into the palm grove. You can make your way upriver clambering, wading, and, in some parts, swimming over cataracts - an enjoyable adventure even for big kids. In autumn, when the river is relatively low, you can even hike right up to the Ottoman bridge and back - but great caution is advised. Moreover, you need a waterproof bag for your valuables. 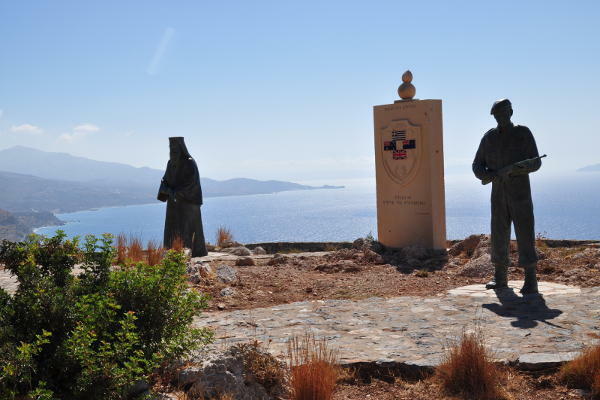 Between the entrance to the beach car park and the monastery, a simple memorial with a bronze statue of a larger-than-life Cretan priest and British soldier towers above the sea on the left. It commemorates the significant role that the monastery played in the days shortly before the German invasion. From here, a great number of British troops, mostly composed of soldiers from Australia and New Zealand, were evacuated to North Africa with the aid of the monks. A memorial in the courtyard of the monastery also commemorates how the monastery supported the British army. Part of the building is derelict, and other parts have been restored or even reconstructed (admission: 2.50 euros). Inside the monastic church, dedicated in 1836, there is an icon on the iconostasis (the screen with images separating the nave from the sanctuary) which is particularly worth seeing. It depicts the story of the creation of mankind. Even if you don’t have a great interest in icons, you will enjoy this one: on the top left, God breathes life into Adam, on the top right he makes Eve from Adam's rib. On the bottom left, Adam and Eve stand naked before the Tree of the Knowledge of Good and Evil, on the bottom right they are driven from paradise by an angel, now clothed with shame. What is amusing are the small animal images: they include a unicorn, a lion and a peacock. You can see many other icons of greater artistic value, from the 17th and 18th centuries in particular, in the monastery museum.